Customers in the midst of digital transformation look first to the public cloud when seeking dramatic simplification, cost, utilization and flexibility advantages for their new application workloads. But using public cloud comes with its own challenges. It’s not always possible or practical for enterprises to retire their traditional, on-premises enterprise system still running the company’s most mission-critical workloads. Hybrid IT – a balanced combination of traditional infrastructure, private cloud and public cloud – is the answer. But a true hybrid IT deployment must go well beyond the current generation of hybrid cloud systems, where the on-premises and off-premises worlds have largely remained siloed and still have to be independently managed. 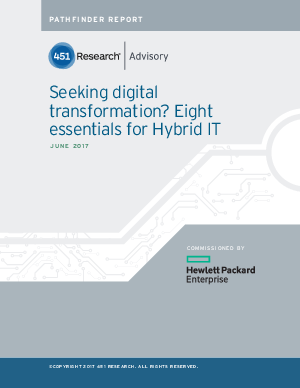 This paper seeks to answer how to bring those siloes together by identifying eight essentials that must be met to achieve the ideal hybrid IT implementation.